Heat oven to 400°F. Spray cookie sheet with nonstick cooking spray. Brown ground beef in medium skillet over medium-high heat until thoroughly cooked, stirring frequently. Drain. Set aside. Unroll dough; place on sprayed cookie sheet. 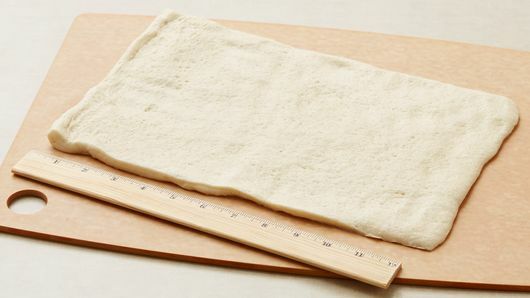 Starting at center, press out dough with hands to form 12x8-inch rectangle. 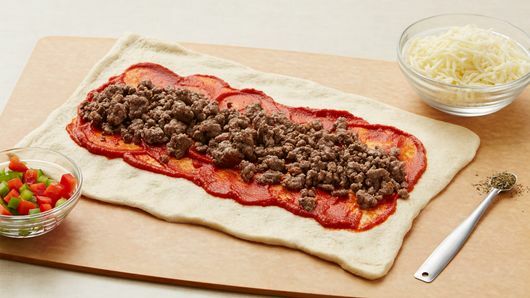 Spread sauce over dough to within 2 inches of long sides and 1/2 inch of short sides. Place cooked ground beef lengthwise down center, forming 3-inch-wide strip and to within 1/2 inch of short sides. Top with cheese, bell pepper and Italian seasoning. Fold long sides of dough over filling; press edges to seal. Bake at 400°F. for 15 to 20 minutes or until crust is golden brown. Did you know? Pillsbury has a gluten free pizza dough. This warm, savory stromboli bakes up in less than an hour and uses only six ingredients. 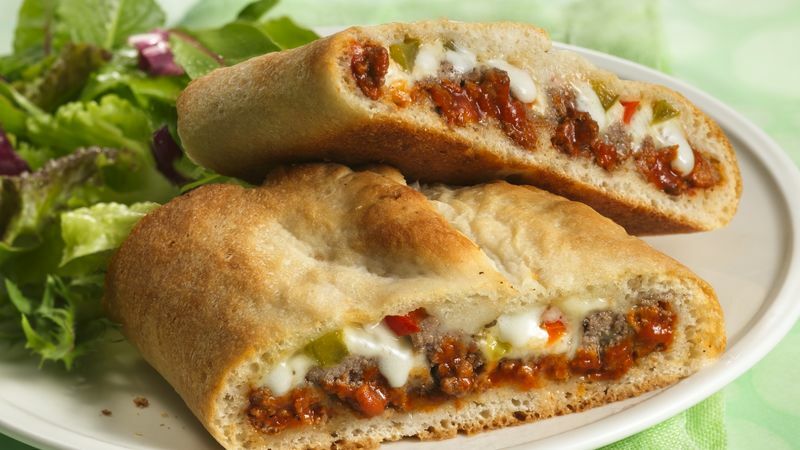 The stromboli is perfect for the whole family; it has the pizza flavor your kids love without the mess of a traditional pie. While the exact origin of the stromboli is the subject of culinary debate, Romano’s Italian Restaurant & Pizzeria, located just outside of Philadelphia, Pennsylvania, claims to have first used the name in 1950. Rumor has it the pizzeria’s owner Nazzareno Romano was looking to expand his pizza shop menu and created the stromboli. Quick tip: If you’re looking for a leaner meat, you can substitute the ground beef in this recipe for ground turkey. You can also customize the cheese and veggies to your own tastes. Looking for more stromboli recipes? We’ve got just what you need. Now that you’ve mastered stromboli, take a tour through our pizza guide for tips on how to make different types of pizza like a savory calzone or Chicago-style deep dish pizza.